For most of the country, prohibition lasted for 13 years. From January 17, 1920 until April 7, 1933, the sale, production and transportation of alcohol was prohibited across the nation. However for some states, this period lasted much longer. Mississippi was one of a handful of states that enacted prohibition in 1907, a full 13 years prior to the national ban. And it didn’t end there. After the passing of the twenty-first Amendment, Mississippi still enforced prohibition laws until 1966. As the last state to repeal prohibition, Mississippians lived under prohibition laws for lengthy 59 years. Even with the repealing of prohibition, it would take another 37 years for a brewery to operate within Mississippi. As Mississippi’s first brewery in almost 100 years, Lazy Magnolia Brewing Company, started in 2003, is also Mississippi’s oldest brewery. We however only had to get 20 weeks into this project to experience Lazy Magnolia as Mississippi joins the United States as the 20th state in December 1817. As mentioned previous on this blog, the federal prohibition decimated the brewing industry in the U.S. While some brewers scratched by making near beer or producing malt extract, most could not sustain viable income to endure the 13 years. But when it ended, most states started to see a slow come back to their brewing industry. One by one, craft brewers started bringing back old favorites, and developing new products for a growing consumer base. And while the craft beer explosion was occurring, during the 1980’s and into the 1990’s, beer lovers in Mississippi did not have a brewery to call their own. Thanks to Lazy Magnolia that has now changed. As they went about blazing this path through the brewing frontier, Lazy Magnolia has kept their southern roots in check with our first sample of the week: Southern Pecan. There are items that elicit memories of the southern U.S., and the pecan is high on that list. A species of hickory native the south-central North American, pecan means a nut requiring a stone to crack in Algonquian. 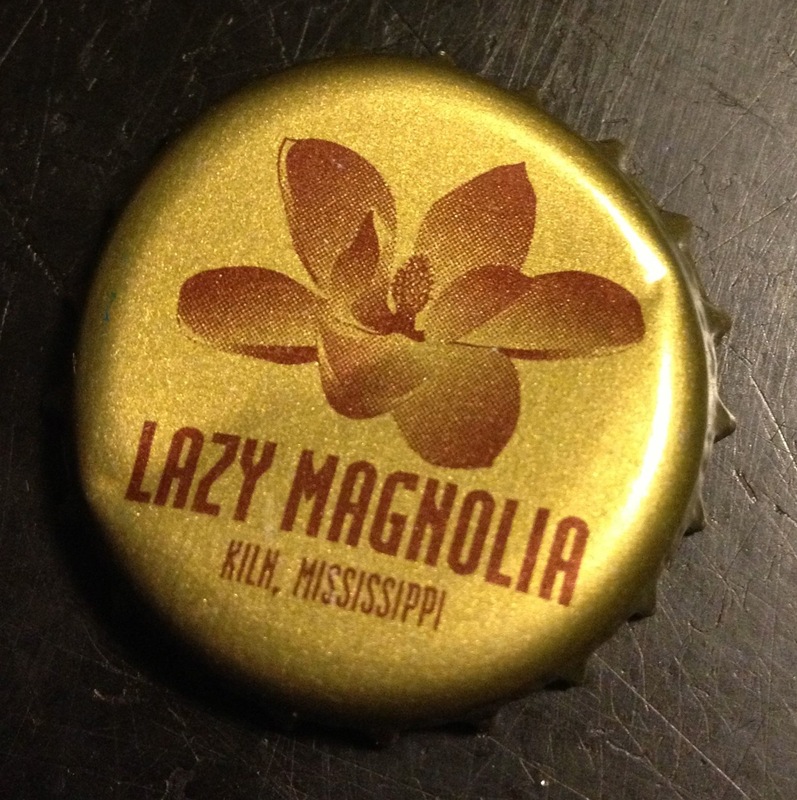 Typically known as the key ingredient in Pecan pie, Lazy Magnolia used this nut as the key ingredient for a beer. Listed as the first pecan nut brown ale in the world, this beer was a fun find. Much like a good Pecan pie, this beer was sweet. Even the color exuded a sweetness, with its deep red hues. But the sweetness wasn’t overwhelming. The beer was enjoyable. And while it didn’t have the distinct pecan taste, there was definitely a nutty taste that made this an enjoyable beer. It would have been interesting to try it with some good cheese that would complement the sweetness. One of the tasters loved the diner menu, vintage look to the label on this beer. It definitely had a nice clean look to it, unlike many of the labels we have encountered so far on this project. When Mississippi lifted prohibition in 1966, that wasn’t the end of the story for slow to change alcohol related laws in the state. In fact it wasn’t until March of this year that Mississippi legalized home brewing. And while that law had a tangential effect on the states brewing industry, another recently changed law had a much larger impact. From the time prohibition was lifted in the 60’s, until July of 2012, brewers in the state were not allowed to produce a beer with more than 5% ABW. To put that into perspective, only 7 of the 89 beers sampled so far on this project were less that 5%. 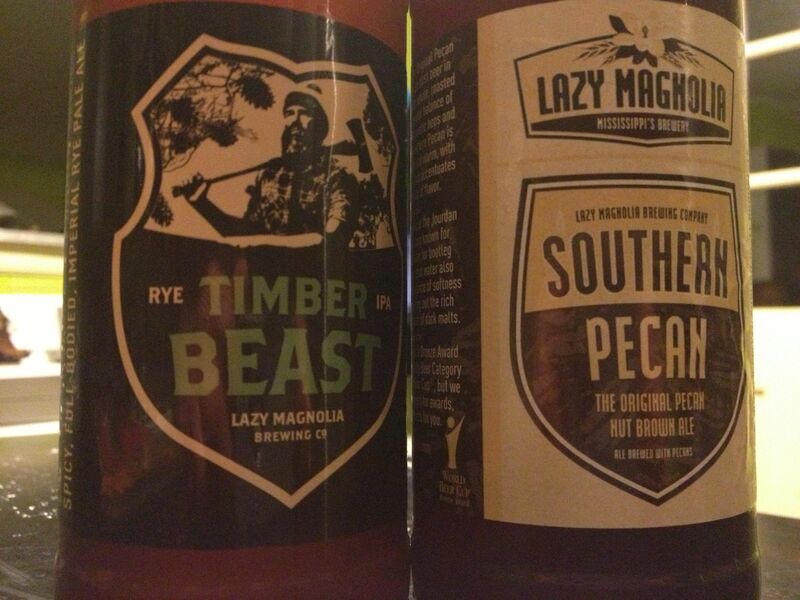 Expecting this law to change, Lazy Magnolia had our next beer, Timber Beast queued up and ready to roll on June 30th. Coming in at 9% ABV, at the time of its brewing, the Timber Beast was an illegal beer. However with the change of an old law, this beer was allowed out into the world, and we were fortunate enough to get our hands on some. This beer was very enjoyable. Using Zythos hops, an IPA style hops blend, Lazy Magnolia went with a recipe inspired by the complex and beautiful flavors of Mississippi. This hops led to an interesting taste that I had not experienced in other IPAs over the course of this project. This hops had a more bitter characteristic that was enjoyable. While the bitterness hung around long after the beer was gone, this wasn’t a bad thing. Everyone tasting this beer really loved it. With Mississippi, we have seen the craziest alcohol laws to date for this project. However we have also seen how a company like Lazy Magnolia can overcome those obstacles to create an enjoyable product. → Illinois: Right Here. Right Now.